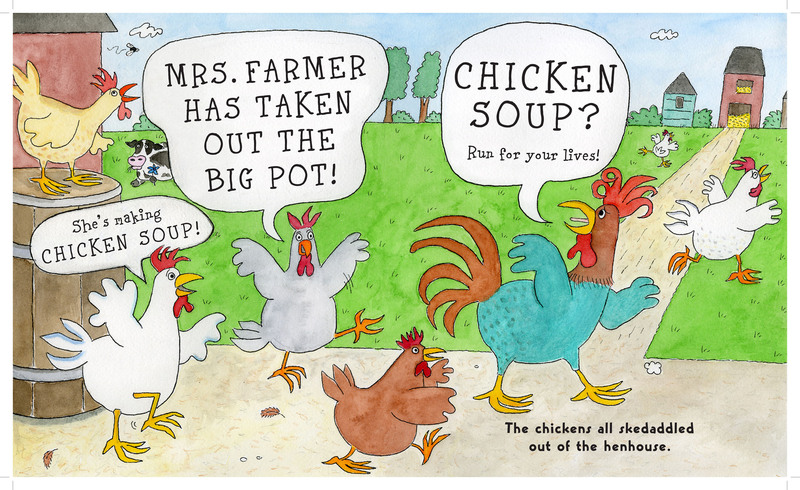 In yesterday’s post, or my attempt to spread some laughs this week via cartoon art, I intended to include a few more titles, but I talked long enough for two of them. 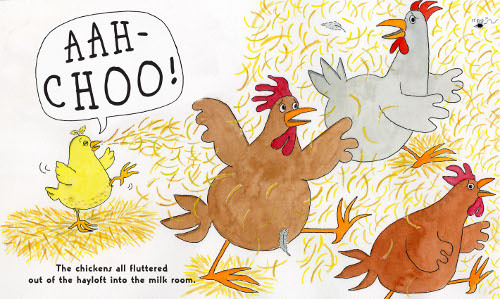 So, here’s my Part Two to that post, celebrating the cartoon-style of illustrating in picture books currently on shelves. 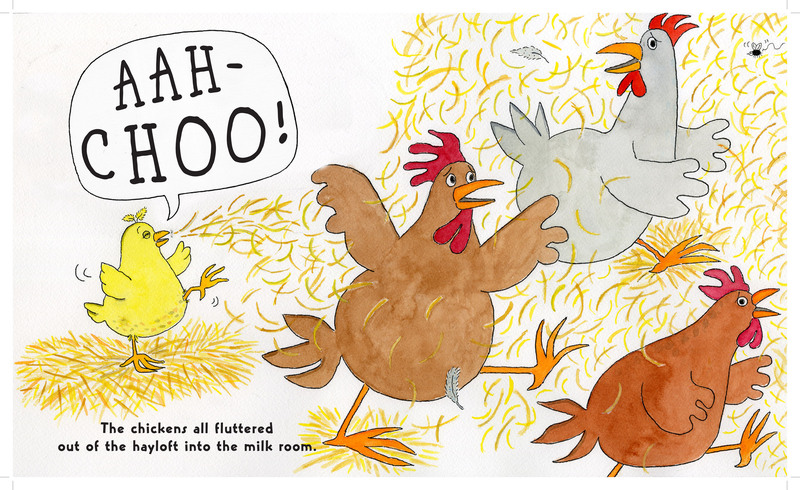 I won’t give away the ending, except to say it’s a clever and sweet surprise for preschoolers. 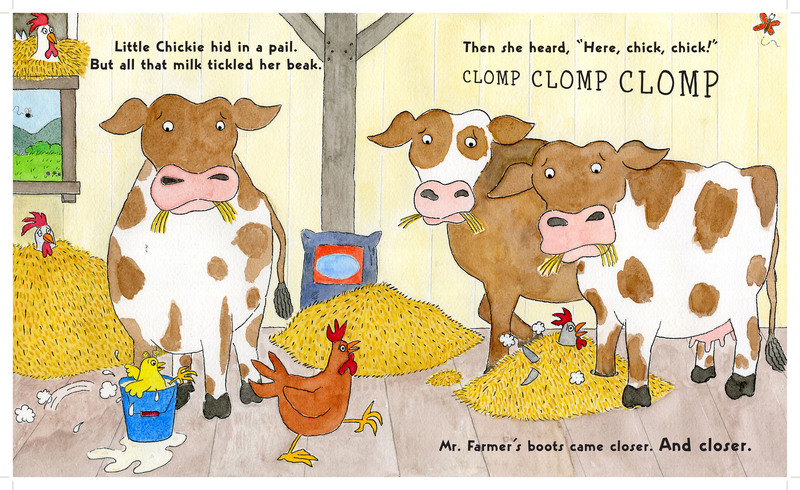 And the entire book is a preschooler treat — from Van Leeuwen’s broadly-humored text, rife with repetition and the types of loud sounds preschoolers enjoy (a “CLOMP CLOMP CLOMP” here to a “SNIFF” and “BAA” there) to Gavril’s pen, pencil, and watercolor illustrations, which are sunny and bright and oh-so accessible to the wee ones. Remember how yesterday we looked at a new title from someone who crossed over to picture books from the world of animation? 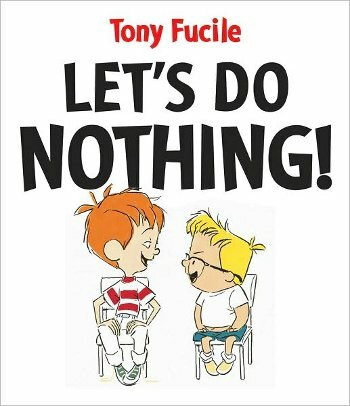 Well, here’s another: Tony Fucile’s Let’s Do Nothing!, released by Candlewick in May. Does Fucile’s background in animation (more than twenty years designing and animating characters for cartoon features films, such as Finding Nemo, The Incredibles, and The Lion King) aid him any in his picture book debut? If you’re Kirkus Reviews, you think so: “His background in animation makes itself felt in the dialogue-based text and exquisite sense of pacing and visual humor.” “Exquisite?” Them’s some strong words, coming from Kirkus. Have you noticed how a handful of books lately are being marketed as the types of books our children need in our contemporary American world of overscheduling our children? Well, I say: More power to ’em. Overscheduling children, not leaving them enough time to get bored and use their actual imaginations, makes me crazy. Downright batty, I tell ya. I know, I know: We hear a lot of groaning about it anymore, but that’s because it still happens. A LOT. The poor teachers of America, getting hordes of children in Kindergarten who expect to be entertained at every moment…Yes, this is brought to you as Number Eleventy Hundred in the Grumpy Old Man Series. There is a lot of humor here — in facial expressions, Frankie’s burning eyes (from trying not to blink), the boys’ animated imaginations, and their apparent relationship to one another (Sal is the one in charge, without question). Fucile’s comic timing is spot-on, and the book is briskly-paced, despite being a book about Doing Nothing. And remember how I said I have no spreads for you? Well, you can see one here (my favorite — this is what happens when the bespectacled Frankie tries to be the Empire State Building). Here. And here. (That’s what can happen when you pretend to be a tree. Harsh.) Oh — and their big moment of discovery. It’s a winner. I hope we see Frankie and Sal again. Okay, a couple more. Quickly, as this post is long enough. 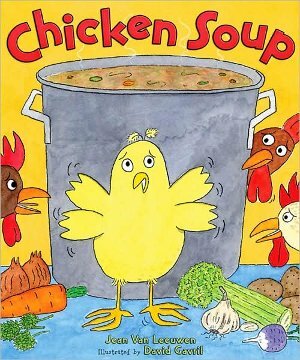 Another picture book trend, in the words of Kirkus? 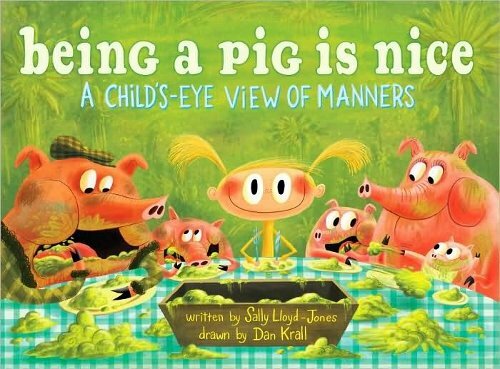 The “willfully amoral ending.” We’ve got one in Being a Pig is Nice: A Child’s-Eye View of Manners (Random House, May 2009), brought to us from Sally Lloyd-Jones with illustrations by Dan Krall. Another animation cross-over: Krall spent years at Cartoon Network, where he worked on such shows as Chowder and Powerpuff Girls. 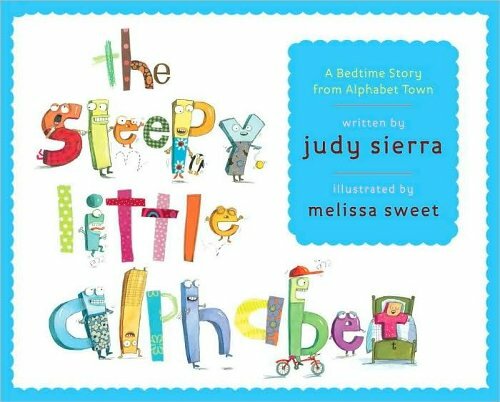 In this title, a young girl, tired of being told by her mother to be polite, imagines trading places with sloppy, muddy pigs; dawdling snails; splashing elephants; monkeys, who get to eat with their fingers (score); and owls, who are allowed to be loud at—and stay up all—night. The young girls finds a drawback to each adventure. 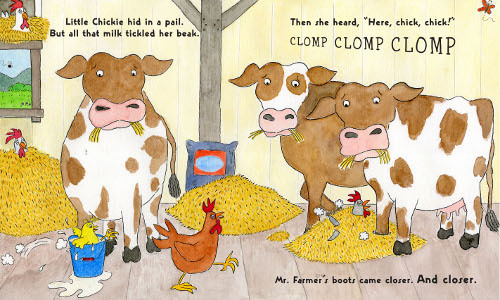 (Snails are slimy, and elephants have flies…and “that’s not nice.”) In the “willfully amoral ending,” she simply decides to be a monster and forgo all manners at the dinner table, much to her parents’ chagrin. (But, you see, “it’s only polite” for a monster to be manner-less.) Krall uses bold colors (lots of deep purples and slime-greens) and no-holds-barred absurdity to bring Lloyd-Jones’ tale to life. Every character is wide-eyed, and every situation is extreme. It’s another goof-ball, slapstick tale, and Cartoon Network fans will likely be immediately drawn to Krall’s lively, stylized illustrations. Will you cross fingers with me for a Jan interview? It’s worth a shot. 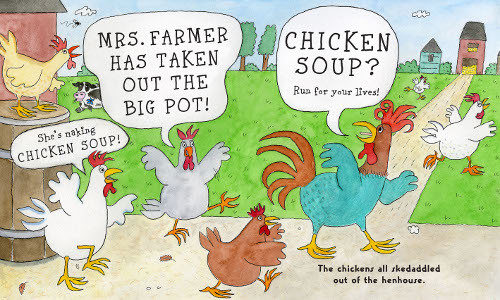 CHICKEN SOUP © 2009 by Jean Van Leeuwen. Illustrations © 2009 by David Gavril. 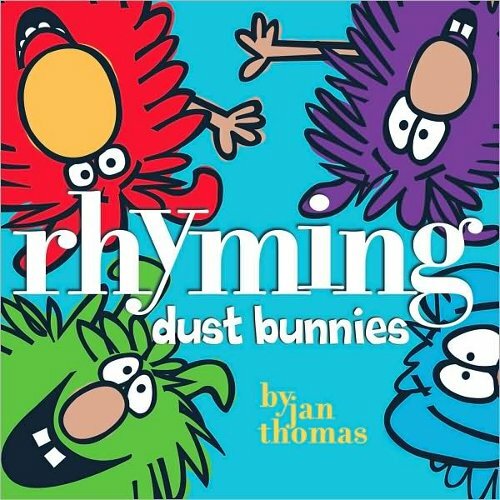 Published by Abrams Books for Young Readers. New York, NY. Posted with permission of publisher. All rights reserved. More books for the library’s collection–and good timing, as I am working on an order to stock up for summer. School lets out in 18 more days! I second that.. the graphics are vivid, the articles easy to comprehend and thorough. Thanks, and I hope to link soon.